It was a story that disturbed us the first time around and the story has gotten even worse as more facts are uncovered. In a recent blog post, we wrote about the Alameda County assisted-living center that “closed,” leaving residents behind when management and most of the staff left. More details have emerged since our first report, details that make the story even more disturbing. The developing story has brought in an important issue in the elder care arena – wandering by elderly individuals, particularly those with Alzheimer’s or other forms of dementia. Wandering is a major concern for care providers and our Northern California elder abuse law firm encourages family members to report any facility that does not actively work to prevent wandering and keep residents safe. As officials have stepped up their probe of Valley Springs Manor in Castro Valley, it appears that residents were actually left without paid caregivers (a few staff members stayed despite being unpaid) for up to eight days, not three as originally reported. The San Francisco Chronicle reports that about 30 residents were at the home when the Department of Social Services posted a closure notice on October 21, giving the facility 72 hours to close due to health and safety concerns. However, it appears that workers began leaving on the 18th when management told them that they would no longer be paid. By the closure date, 19 residents remained, abandoned by management and most of the staff. It does appear that the state was supposed to ensure residents were transferred or picked up by family. It now appears that one resident is missing. A staff member (one who stayed to help the abandoned residents despite not being paid) reported Edmund Bascom missing on Friday. The 65 year-old suffers from mental illness and has a history of wandering. Sgt J.D. Nelson, Alameda County Sheriff’s Office spokesperson, said Bascom wandered away from residential care facilities at least ten times over the past five years. He was previously located in Oakland, Castro Valley and the San Leandro BART Station, which is where he was last seen on Friday afternoon. Bascom is described as a 5’10, 180 pound black man with brown eyes and black hair. When last seen, he was wearing an Oakland Raiders shirt, blue pants, a fishing hat, and black boots. 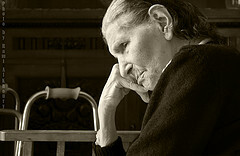 Statistics suggest that around 60% of patients with Alzheimer’s will wander. The Mayo Clinic and The National Institute on Aging provide tip sheets for caregivers dealing with Alzheimer’s or other seniors who are prone to wander. They recommend keeping doors locked and using out-of-reach deadbolts, camouflaging doors/doorknobs, or installing alarm systems to help prevent the person from leaving their home. Activities, including distractions planned for a time when a person is known to wander, can also help. Putting identification in the person’s clothing or even using a GPS device can help in case wandering does occur, as can keeping neighbors aware of the possibility that the individual may wander. While it is not always the case, wandering can be the result of unmet needs, a factor to consider if a loved one wanders from a care facility. You should contact law enforcement if a loved elderly individual goes missing. A Silver Alert, similar to the better-know Amber Alert, may be issued in appropriate circumstances. We hope Mr. Bascom is found and safely returned home. We also hope the investigation into the events at Valley Springs identifies those responsible for the apparent failure to properly care for the facility’s residents. Hopefully the investigation also helps establish guidelines to prevent a similar series of events from occurring in the future. Please call our office if a senior care facility fails to take reasonable precautions to prevent wandering and it results in a loved one’s injury or death. As a San Francisco nursing home neglect attorney, Greg Brod is committed to representing seniors who are the victims of elder abuse in all its forms. Call to arrange a free consultation.